Like many allrounders it's a jack-of-all-trades but doesn't excel in flatwater or the surf. Versatile paddlers wanting a standup paddleboard that can do it all. This board is perfect for both flatwater paddling as well as small to medium sized waves. 10’0”, 10’6”, 10’10”, 11’00”, 11’4”, 11’6” – The 10’6” is perfect for lighter paddlers while heavier paddlers (over 80 kg) might be better sizing up to the 11’4” or the 11’6”. One of the best things about the Naish Nalu is that its stable yet easy to maneuver, making it a perfect board for beginners or intermediate paddlers wanting a great all-around board. It’s surprisingly fast for its size and glides smoothly through chop and small to medium waves. The 10’6” rides like a classic mal, but with more stability. If you want to dabble in nose riding, the 10’6” might be too small and the 11’4” would be a better fit. You can’t go wrong with the Naish Nalu if you’re in search of a board that can handle all types of conditions. The board is so easy to paddle and turn, there’s virtually no learning curve once you hop on. It’s hard to think of a better board that is a jack-of-all-trades for standup paddling. It has a relatively low price point compared to its competitors on the market and is perfect for paddlers looking for one board to do it all. Since the board is so versatile, it makes for a great family board. Beginner paddlers can learn on the board while intermediate riders are able to progress. If you’re limited on space, going on vacation, or need a downsized quiver, it’s likely that this board will tick all the boxes for being the only standup paddleboard that you’ll need. Tail rocker makes the board easy to turn in the surf while the wider deck and nose keeps it stable. If there is any drag on the board in flat water, removing the two side fins and paddling as a single fin is an easy fix. In the surf, the three fins provide enough drag to keep it stable without slowing it down too much. 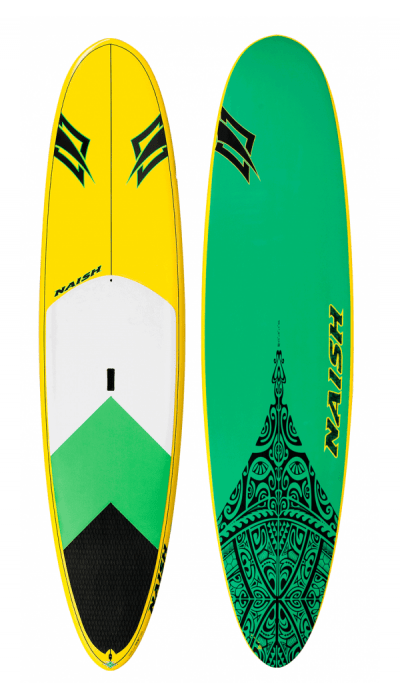 As for style, the Naish Nalu is a beautiful board with vibrant yellow accents. Colorful standup paddleboards sometimes come off as tacky, trendy, or the color warps quickly under the sun. However, this board is tasteful enough to look good in the lineup for years to come. The wooden-finished version (GT) is even more stunning and not that much more expensive than the standard GS. 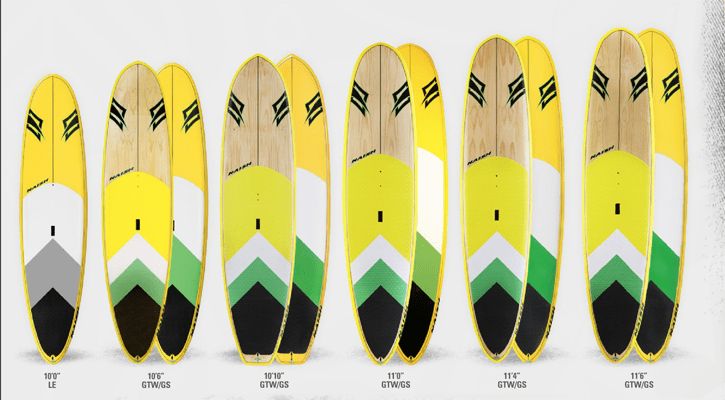 The Naish brand is also renowned for producing high-end boards that are durable and well made. There’s no shortcuts when it comes to glassing or shape with the Naish Nalu, a concern with some of the cheaper pop-out standup paddleboards. Expect it to last for years even with heavy use with only standard ding repairs needed here and there. There aren’t any obvious downsides to the Naish Nalu. It’s a board that’s not only beloved by me but also across the board in the standup paddling community. The Naish Nalu is often revered as being the go-to board for paddlers not knowing where to start. But, like most all-around boards, the Naish Nalu won’t be the right board if you are looking for a strictly flatwater board or a board you can compete with in the waves. Though it’s advertised as being capable of handling double overhead surf, the smaller sizes are a bit too unstable for heavier paddlers in heavy conditions. It’s also too slow to be a serious contender for a touring or racing board. (Note that these cons come with nearly every all-around paddle board.) So if you’re a recreational paddler looking to do it all and dabble in the surf for the first time, this is a great board for you. If you’re looking to surf jaws, then you want to go for a true surf SUP. The Naish Nalu 10′ Carbon Pro is another longboard style option you can consider. Sizing can also be tricky with this board. Anything below the 10’6” might be a bit too small for larger beginners, so when in doubt, size up. I’ve been flat water sup boarding for 3 years am 75 yrs young and 97 kgs and a bit shaky , currently I’m using a Naish 12’ x 6’’ inflatable which has been great but I am keen to upgrade to. 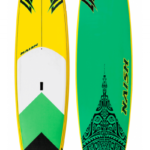 Naish solid board , maybe a Mana 11.2’’ or a Nalu GTW , 10.10’’ , what would you recommend ? maybe there are better options . I would be very grateful for any advice you can give me , thank you .